When I first got invited by my best friend and blogger extra-ordinaire Cha Sy to the Media Bloggers Event with the 2014 Ms. Earth candidates, I did not immediately sent out a reply. Others would have grabbed the opportunity with greedy hands, yes, but moi? No, not I. I don’t have anything against the beauty queens so please don’t try and read something else into this statement. It is just that a 5’ 1” me isn’t too comfortable being in the same room as these towering exquisiteness. I just always feel like I’m a basketball when I am surrounded by tall people, that’s all. Haha! D’ DAY: GREEN MEANS ALL SYSTEMS GO! So off I went to the meet and greet with The Exquisites. Haha! It seemed apt to call them that. So I started calling them The Exquisites in my mind. I even brought my highest-heeled shoes so I won’t feel too David-ish (of the biblical story dear readers) when I finally see them. 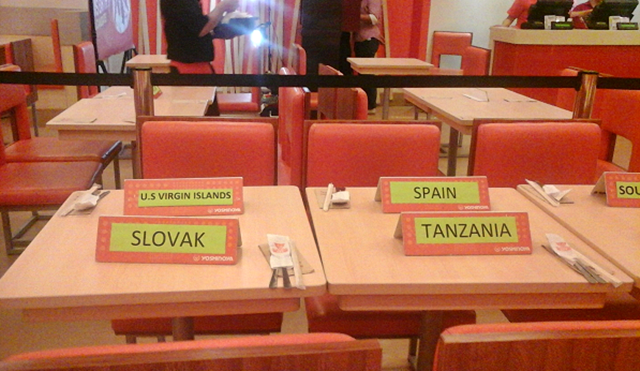 The generous luncheon host was Yoshinoya at the 2nd Floor of SM North EDSA. We were a bit early and somehow seeing the venue empty, saved for some earlybird bloggers like me and Cha, helped calmed me. Then the placed soon filled up, both inside and outside and the arrival of only 29 out of the 35 Ms. Earth Candidates were announced and suddenly everything were a blur. I started taking pictures of the candidates. Not posed. Not studied. Why? Because I want to elaborate on the commonality between them and us (you readers and myself included). Often they are placed on a pedestal, revered, admired for just their obvious beauty and charm. But these girls all have something else to offer. It is not saying that they shouldn’t be admired for their beauty alone. But what I am pointing out is that these girls are here for a very beautiful cause and I refused to concentrate on just their overtly media-magnified charms and not focused on the “why”. Why they are here last November 29th representing their countries, in the first place, via this pageantry of Ms. Earth 2014. Like the very sweet and obviously very charming Ms. Fiji, she is espousing eco-tourism. To quote her, “back at home, I helped educate and bring awareness to the young people like me that there are many beautiful places in our country and we should all go hand-in-hand in taking care of them because it is a legacy of Mother Nature to us all”. 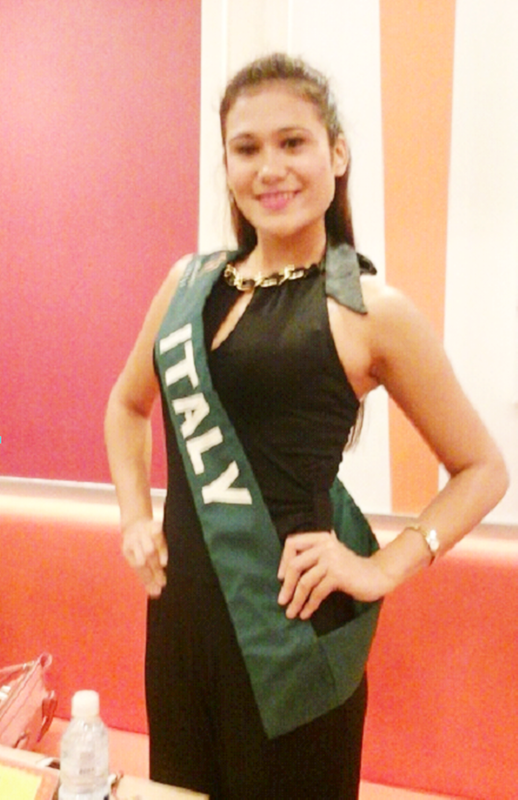 I also approached Ms. Italy. This time not to specifically asked about her Ms. Earth advocacy but to ask if she has any Filipino origin. And I was so right! She said she was born and raised til the age of 9 here in the Philippines until her parents finally decided to go back to Italy. Her mom is the Filipina. Ms. Northern Ireland and Ms. US Virgin Island were also both into teaching the young to do all that they can contribute towards taking care of the what are obviously a gift no one can ever generate by their own hands. They also said more and more countries should cultivate eco-tourism tours as that is truly a good way to promote sincere conciousness and efforts to help save Mother Earth. I did not anymore interview the current winner of the 2014 Ms. Earth winner who is our very own Ms. Earth Philippines, because I always believe in giving others the chance. She is ours and Filipinos know how to take care of what is ours. Yoshinoya YCPI. Phils. also has its own advocacy. They have Friends of Hope, Inc. which is a non-stock, non-profit organization that sell purified water in 350ml and 500ml at all Rustan’s Supermarket, some committed-to-help retailers like our usual favorites Starbucks, Krispy Kreme, Jamba Juice, Seattle’s Best and The Coffe Bean and Tea Leaf and of course, at all Yoshinoya branches and they use 100% of their profits to build public school classrooms all over the country. They seek to empower consumers to make choices in their purchases so we can all have a part, however minor, in changing our country for the better, through education. So when you next grab a bottled purified water, look for HOPE. Cause drinking water not only is good for your own health, it’s good for our country too because drinking HOPE water now build public school classrooms.